Whether a commercial or residential project, whether it's demolition or renovation, most construction projects will probably involve the use of a crane. 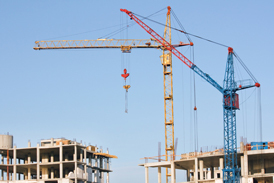 With multiple workers crowded into a work site, a crane accident can happen and can be serious. Who is responsible when a crane accident occurs? It could be the operator of the crane; was the operator properly certified? It could be the manufacturer of the crane. It could be the owner or General Contractor (GC) of the job site. It could be a question of who was responsible for maintenance of the crane. When you call The Law Office of Robert Dunne, I will investigate the nature of your accident to determine how to best build your case for success. Accidents Can Happen. Let Me Help. Do not assume that an accident or injury is your fault and never be afraid to seek help. Call lawyer Robert Dunne for a free consultation at 212-551-1750 or contact me online. Injuries can happen because of improper maintenance of the crane, including brakes and cables, hoisting mechanisms, locking devices, lubrication, guarding of moving parts, improper operation of the crane, the crane operator not being fully licensed or even a licensed crane operator who simply does something wrong. Perhaps the load was too heavy. There are also rules regarding the proper inspection of all equipment, including cranes, at the job site. The owner and general contractor on a project have certain duties and may be legally responsible for the accident. In addition, OSHA regulations must be followed. A lawyer with experience in construction accidents can help you determine the best route to follow to help you get the compensation you deserve. Call The Law Office of Robert Dunne for a free consultation at 212-551-1750 or contact me online.